"This warm apple cobbler is topped with an easy biscuit recipe. Preparation time is 20 minutes. This recipe is from The WEBB Cooks, articles and recipes by Robyn Webb, courtesy of the American Diabetes Association." In a large saucepan over medium heat, combine the apples, water, cinnamon, cornstarch and fructose. Cook until apples are soft and mixture is thickened, about 10 minutes. Pour the apple mixture into a casserole dish. Prepare biscuit dough by combining the whole-wheat pastry flour and baking powder. Add the oil and stir until well mixed. Add the honey and buttermilk; stir with a fork until flour mixture is moist. Add additional milk if necessary. 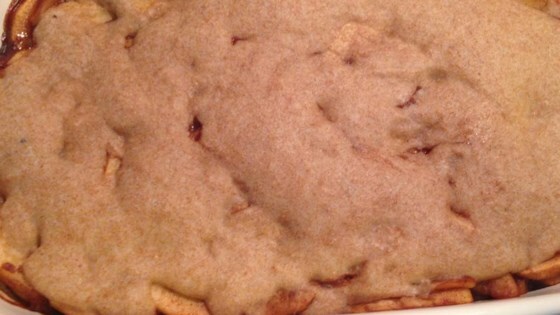 Drop biscuit dough by tablespoons on top of apples. Bake for 20 minutes or until biscuits are golden brown. Serve warm. Very good! I have been diagnosed with gestational diabetes for a week and was looking for ANYTHING sweet. This was really nice and easy to make! My husband loved this when I made it for him. I didn't buy the pastry flour, so I just used regular whole wheat flour and did minimal mixing. This is a low-fat cake and I like it. It doesn't take much time to make. As I am a diabetic I lowered the amount of sugar. Also you should lower the oven to 150 degrees. we all loved it a lot of caleries like my mother is diabetic and that was the max she could have in a day! i change the servings and it was not as sweet as i wanted but it was really good anyways!